Low prices. OrangeSmile.com offers car hire service in Morocco on the lowest-rate-guarantee basis, since we work with car suppliers directly. For your search criteria in Morocco, we always select and show the best rental offers. The car reservation process consists of 3 simple steps: (1) search for available cars for your dates in Morocco; (2) select your car type; and (3) fill in the booking forms. Once the reservation is completed, you will receive a confirmation voucher to your email address. During the booking process, please check your rental conditions. To pick up your car at the rental point in Morocco, you need to provide our confirmation voucher, your driving license and a valid credit card. The final payment is normally carried out at the pick-up point. Our car hire points in Morocco accept VISA, MasterCard, etc - please check your rental conditions. At the pick-up point, please read the handling manual and check the car for present defects. 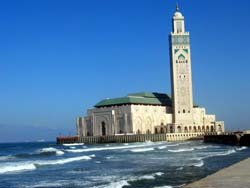 OrangeSmile.com wishes you a pleasant journey to Morocco! The car hire reservation system OrangeSmile.com allows renting a vehicle in Morocco within 10 minutes. Our largest database of car suppliers enables us to provide you a rental car in Morocco at the cheapest rate ever possible. At rental locations in Morocco we offer the following car sizes: mini, compact, economy, standard, premium and luxury. The following car types are available in Morocco: Sedan, Hatchback, Jeep, Cabriolet, Coupe, Minivan and Minibus. An amazing country, which miraculously mixes traditions of Islam and European culture, Morocco never ceases to amaze travelers with its unforgettable places of interest. Simply every city in this ancient country keeps numerous mysteries and secrets. The capital of the country alone is home to more than a hundred of interesting buildings, bazaars and museums. Tourists are recommended to visit such sights as Kasbah of the Udayas, Mulay Slimane Mosque and Moulay El Mekki Mosque, ruins of Yaqub al-Mansur Mosque, the Royal Palace and tombs of Kings Hasan II and Mohammed V. When it comes to culture facilities of the country, the most famous ones are the Museum of Ancient History, the Museum of Moroccan Art, the Museum of Archaeology, Ethnographic Museum, the Museum of Natural History and the Art Gallery. The city of Marrakech is an important tourist destination. The so-called historic part of the city is naturally the most attractive one for tourists. The central part of the city is the location of the Koutoubia Mosque, the building of which took place in the 12th century. The beautiful minaret, the height of which is 77 metres, remains the main peculiarity of this mosque. Jemaa el-Fnaa Square is located right in front of it. All biggest streets of Marrakech start from the square. During a walk here you will see beautiful palaces, museums and mosques, but large and bustling bazaars still remain the main distinctive feature of the city. Local bazaars are usually bound to a specific type of a product, and one can find virtually anything there. There are bazaars that specialize in spices, leather goods, markets for historical artefacts and clothes, and, of course, food bazaars. The city of Casablanca is a wonderful place where visitors will find different entertainment. This is a large port center and a famous historic region. The square of United Nations is considered the heart of the historic district. Old main historic landmarks are located around the square. These are Notre Dame de Lourdes Church, Church of the Sacred Heart of Jesus and Big Mosque of Hasan II. Don't forget to visit numerous parks, during a walk in which you will be able to see tenths of wonderful mosques. The suburbs of the city are also a very interesting place from a historic point of view as they are the location of the ancient settlement of Anfa. Visitors will see here ruins of houses, ancient temples and squares. Archaeological excavations never stop on the territory of the settlement. The city of Fez is also rich in places of interest. This is the former capital of Morocco and the main cultural center of the country. There are several old protective facilities in the city and other important landmarks, such as Dar Batha Palace, Al Quaraouiyine Mosque, Andalusian Mosque and the tomb of Idris II. Travellers are recommended to ask whether it is possible to upgrade the rented car for the same money. Rental offices in Morocco often try to please their customers in case of an opportunity.